One woman's quest to become a better person in all ways through reading. To be completely fair and totally transparent, I am no poetry buff. In fact, I can count on one hand the number of poetry books I have read cover to cover. So please, if you are looking for a seasoned, professional reviewer of poetry, keep on looking. However, I am still The Ardent Reader (and not a newbie to this reading thing) and I believe poetry is one of the bravest forms of self-expression, because a poet can almost always guarantee that the majority of people won't understand what he or she is trying to convey with words or otherwise. For that reason I admire people who decide to try their hand at it. 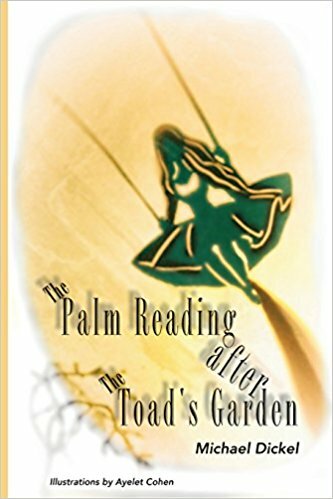 That being said, Michael Dickel's collection entitled The Palm Reading after the Toad's Garden was not straight up poetry, nor was it prose. 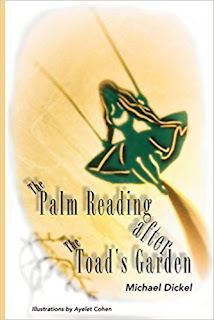 It was a series of stories - well, not really stories, either - more like encounters told from a variety of perspectives. It's sort of like art, made of words. In the beginning, some of the language in Dickel's poems made me anxious, until I realized it may have been the author's intention to make me feel anxious. Further into the book I found poems that were simple and beautiful because they were about everyday stuff. I don't know why I liked those so much, but I think it's because I felt the moments were captured in a genuine way. Some were fun, such as Words and God's Pop Quiz (hilarious, reflective of reality, also sad) and some tackled hard stuff, like Final Destination. I found myself wondering how much of what Dickel wrote was taken from real life, and how much was conjured. I think when you can't tell the difference, that's a good thing. I hope you find something here that sparks your creative fires. I enjoyed reading Dickel's collection. It was almost like visiting someone you just met and peeking in on their knickknack cabinet, wondering what the story is behind each item... and dying to ask. See, that was almost poetic, right?